This study was designed to assess the potential effects of Astragalus membranaceus (AM) on the growth performance and antioxidative stress response in bluegill sunfish (Lepomis macrochirus) exposed to challenging cold water temperature conditions. In this regard, fish with an average weight of 43 ± 1 g were divided into four groups and fed daily with an AM-free diet (control), and 1.5, 3, and 4.5 % (w/w) AM-incorporated diets for an 8-week period. Oxidative stress response, biochemical, and growth parameters were measured, and subgroups of fish were exposed to the outside challenging cold pond water temperature (1.6–9.9 °C) with an average of 7.0 ± 0.1 °C beyond the optimal temperature. The results showed that incorporating AM in the diet significantly improved growth performance parameters (body mass gain, specific growth rate, length, condition factor, and feed conversion ratio) and biochemicals (aspartate aminotransferase and alanine transaminase activities, and glucose and cortisol concentrations). In addition, markedly up-regulated superoxide dismutase, glutathione peroxidase, and catalase activities were observed in AM-treated fish groups over the control. 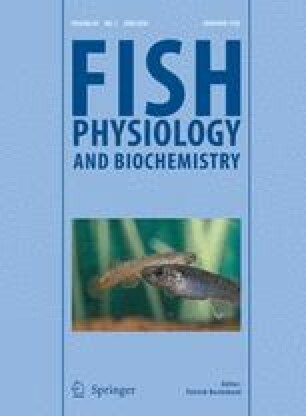 Conclusively, feeding AM diets significantly increased (P < 0.05) growth performance and antioxidative stress profiles throughout the entire experiment, and this increase was much more pronounced at 8 weeks after the water temperature began to rise, which can be related to the nature of Bluegill fish as it is known to be a warm water fish. These findings are considered to be of great importance for sustainable aquaculture. This study was supported by the National Institute of Food and Agriculture (NIFA), US Department of Agriculture, under Agreement No. 2010-38879-20946, and Cultural Affairs and Missions sector, Ministry of Higher Education and Scientific Research, Egypt. Salaries and research support were provided by state and federal funds appropriated to The Ohio State University, Ohio Agricultural Research and Development Center. We thank Kun-Qian Zhu, Dean Rapp, and Paul O’Bryant for their assistance throughout the experiment, and Joy Bauman for her comments on the manuscript.